We have been running this competition for many months now, and from the beginning we notified Bruno that he was selected as a winner, but at the time he was super busy, so we deferred the announcement to October. Meanwhile, he joined us as an adviser and for the sake of transparency, we decided to make this an honorary award (no prize) – because frankly, his contributions to the Java community and they way he supports his peers and Java developers is outstanding, plus we received hundreds of nominations suggesting Bruno. The final poll will exclude Bruno and Juggy and everyone can vote from the list of 9 winners. To make it a little more interesting, I interviewed Bruno and Juggy, because that bird has got quite a big mouth and lots to say! Bruno: Tell us about yourself. What’s your current occupation? I’m a mix of many things. I like to say that I run several startups! One, that is not a startup anymore (because it is already a established company), Summa Technologies, where I’m a Java consultant, working on large Java-based, mostly cloud focused, projects. I’m also CTO of ToolsCloud, a company that provides open source development environments in the cloud. We have lots of customers in Brazil, and we are trying to grow it. I also helped out StoryTroop, an amazing story-telling site, that is a great idea that still didn’t find its place in the world. The funny thing is that most people know me for my volunteer work. I’m one of the founders of SouJava (one of the largest JUGs in the world), and the president of Campus Party Institute (the non-profit that runs Campus Party Brasil, one of the largest internet events in the planet). I’m also a director at the Open Source Initiative (yep, the guys that hold the Open Source Definition). And a few others. I think my first large project, that was used commercially at least, was a management system for bread bakeries. My father had a chain of bakeries in Curitiba, and the software they had available was just terrible, so, under my father’s detailed requests, I create one for him. It ran for far too many years, but it doesn’t exist anymore. I think the project that I participated that is most visible to this day is the Income Tax Application in Brazil (it won one of the first Duke’s Choice Awards). This year, it was used by nearly 20 million people. You were the President of SouJava. How did this come to be? SouJava was born out of a group organized by Sun that met for 2 years in 1996, to discuss Java. I was the main speaker at those meetings, and we were a small group of good friends. We covered absolutely all that was available about Java at the time. Then, in 1998, SouJava was born. I wasn’t the first president (Einar Saukas was), but I was really the group’s evangelist at the time. I got to become president in early 2000, when the group started a movement to bridge the gap between the Java and the Open Source communities. Around that time, we launched the Javali project, that later helped create the Apache Harmony project. How did you help the Apache Harmony Project? Harmony was really important to get the Java community to see the importance of an open source implementation of the Java specification. It helped bring light into the efforts of dozens of Java developers that were working on free Java implementations, and were being ignored by both the Java community (because those implementations weren’t complete or compatible) and also by the large free software community (because for everyone, Java was not free, so, why bother). At the Javali project, we wanted to bring light to this discussion, and we started to promote that the existing projects should target full compatibility. We invited Dalibior Topic (from Kaffe), Mark Wielaard (from Classpath) and Geir Magnusson from Apache to visit us in Brazil, and they got convinced of this idea, and Harmony was born. It was really important to shake the market at the time, and I don’t think OpenJDK would have existed if it was not for Harmony. It was a bold important move, but I can only get a bit of credit for helping to push the idea to the right people. The Apache Harmony team, together with the guys from the Classpath project and many other free implementations of the JVM are the brave developers that really made it all happen, and are still making it, because many of them are now working together on OpenJDK! ToolsCloud is a company I co-founded with Java Champion Fabiane Nardon, one of the most amazing developers I have ever known. We wanted to get developers a fully functional, enterprise level environment, that could be easily customizable, using the best open source tools available. The thing is, I see a lot of amazing developers out there, that are super talented, many of them my friends, and they are responsible for installing, configuring, backing up their teams tools. What a waste! We wanted to give them the peace of mind to just go work on the code. So, we take care of the tools. Let great developers be great developers. ToolsCloud today works with many companies getting their Java projects continuously deployed and their DevOps teams working together! There are many reasons to choose Java. It is fast, multi-platform, you don’t get tied to a single vendor, it works nicely with every other language, it has an amazing set of tools available. But really, the best part of Java is the Java Community. Because Java was so open when it first show up (it is always good to remember that Java was distributed with Source code, even before it existed a definition of what “open source” was! and it was an answer to the lock-in that existed at the time), it helped create an amazing community of developers interested in openness. It was this interest in open that made this community to help push the Linux movement and also the rebirth of Macs, and even the mobile and recently, cloud. Java developers require open, multi-vendor solutions. Java put openness back into developers minds, and the community that spun around it is an amazingly open, eclectic, inclusive community. The Java community is even inclusive to other languages! I think this is pretty cool! Can you tell us what you like about Jelastic or share any apps or projects created with Jelastic? I have a lot of projects running on Jelastic today, and the reason is simple: Jelastic brings this same ideas of openness to developers of cloud applications. Jelastic is not a single-vendor cloud, that wants to tie you in. On the contrary: being based in Java standards, you can basically run anything Java (or even other technologies) in it, no need to tie yourself into some specific vendor’s API. Jelastic is that perfect environment developers would build themselves to run their apps. But instead of the hard problems of building it, it is easy to just use it. And, because Jelastic is not a single vendor, but a community of providers spread all over the globe, it promotes a much more inclusive and decentralized cloud, that can really reach developers all over the globe. I really think Jelastic should be more active in the open source community. It is great that Jelastic supports all the right open source projects and allows developers to just depend on open source solutions, but I think that to really create the freedom for Jelastic partners, to really make this into a community of cloud providers, Jelastic will need to consider how their infrastructure will play compared to the open source ones, and what they need to do about it. Another interesting area is some integration on Jelastic platform with Docker containers, to make it more flexible to add new stacks to the platform, this may give developers another level of freedom, that can easily attract them to the Jelastic platform. Meet Juggy the Java Finch. He’s confident and hilarious. Tell us about yourself and how you and Bruno met. Well… Finches flock together, and we are very active and smart, just like developers. Finches are also everywhere. And of course, I’m a Java Finch, original to the Java island, where we meet in great numbers, and I have a birthplace love for Java! But the best of all, Java Finches are natural friends of Duke, we even share the same colors! As the story goes, Bruno was introduced to Java Finches by a friend in one of the world’s largest Java projects of the time. From that day, it was clear that I would be a great partner for Duke. 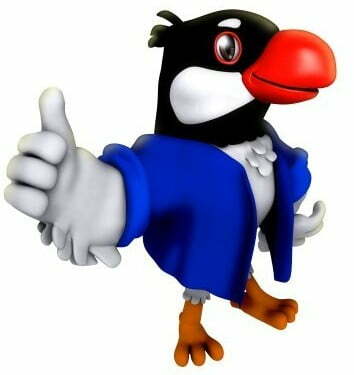 But it was many years later that a large group of JUG leaders discussed a mascot for the worldwide Java Users Group Community, and they called me in to interview for the role. I must say that I loved the idea of sticking together with Duke and all those great Java lovers. I love Java too, and love developers even more! C’mon! 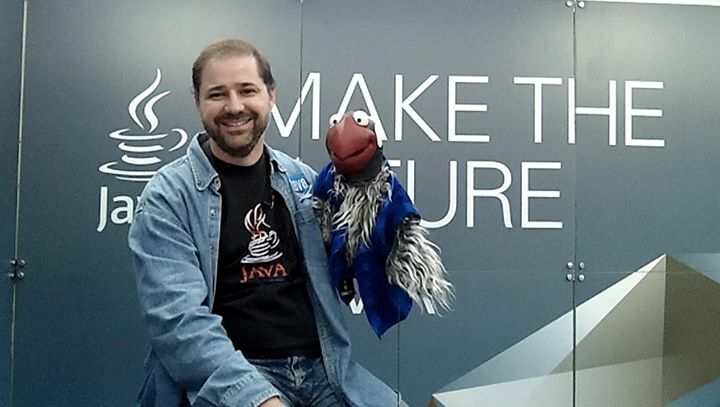 I’m the mascot of the most awesome community of developers, the Java User Groups, Java is my birth place. Best of all, I talk, and since Duke doesn’t, I’m really the one that can translate his wishes to developers everywhere! Oh, and I’m building a flock of RoboJuggys to get developers to have fun with Java and robotics. How cool is that? Who do you think is the most interesting developer in the world (excluding Bruno) and why? Let me say that I have a special love for JUG leaders. They are volunteers, that do what they do out of care for the Java technology, and for the fun of sharing and improving their local communities. If you love developers like I do, you must love what those JUG leaders do for developers everywhere! Seeds, and fruits. Coffee beans are particularly nice, specially when they aren’t dried and roasted like you guys do. There is a bunch around here where I live. I’m not sure if my friends in the wild like that, but I do! I have a very special “Angry Birds” bag. You know, that red bird? It matches my beak color. It is pretty soft inside. Nice and cozy! Do you travel with Bruno? If yes, do you get your own hotel room and seat on the plane? Well, he actually travels with me. I like to go places. He comes along for the ride. If he comes with me, I don’t need to pay for seats or hotel, so, it’s a win-win. Why do they call Bruno “The JavaMan”? Who is more popular? You or Bruno? He has to walk around with a Brazilian Flag just to be recognized. I can just be me! Also, see the last JavaOne video, guess who’s in it? I was there at the moment Sun announced OpenJDK! And you know those Harmony guys? They are personal friends, have even been to my show: Geir, Mark and Dalibor. I was even there in the most bizarre Java community video. I personally think that my mistaken instructions was what got Java open sourced. And you know what? Guess who is behind the scenes, pushing Java? Wow wow wow! Those guys are deadly! Careful there! Spiders are the real net-workers! We will be publishing the final list of winners soon and you can vote for The Most Interesting Developer in the World!